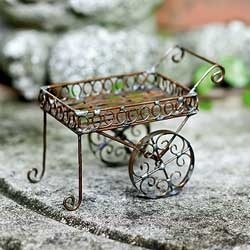 Mini Tea or Garden Cart for Miniature Fairy Garden Store Gardens. #01530. 3"h x 2"w x 4"L.
Display Hint: Place Some Preserved Moss In Card For A Beautiful Landscape!